Holy Crap, Star Trek is Real! So it occurs to me that my Scifi show review is missing one critical piece: Star Trek the Next Generation. How I forgot to review it is beyond me, but I’ve almost finished rewatching the series on netflix, and while I’m not quite ready to write up the review I am ready to talk about something awesome. 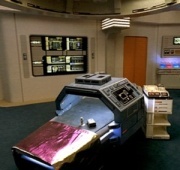 I’m going to tell you how we’re living in Star Trek’s future right now! Much like the early cellphones, they were big, unwieldy and ugly. This was from the Original series by the way, from the 1960s. Then we moved onto smaller cellphones, classy and sophisticated. 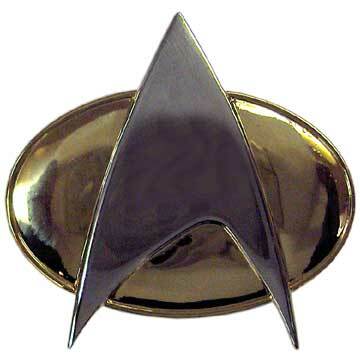 Of course then we got completely hands free devices, like the com badge here. 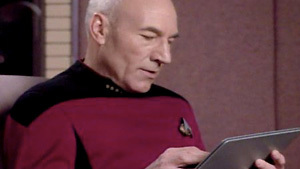 You know how they kept downloading new information to those IPads and Tricorders and stuff? A Wifi network. Or something similar. I mean, do you see any wires coming out of those computers? Nope. Remember this was the 1980s, the internet had only been invented in a primitive fashion in the form of ARPANET. The wireless transfer of information was completely out of the realm of possibility at that point in time. This one is creepy because of how damn specific it is. In the 2nd season episode Peak Performance, Data and an alien that looks like a blobfish (look it up on google if you want, I won’t inflict such a picture on unsuspecting readers) get into vicious battle. In a video game that is, a game called Strategema. It’s incredibly primitive by our standards, but look at how damn fast they have to move their fingers. This is something only a sci-fi writer could come up with right? There’s no way a normal human being could possibly move their fingers that fast and keep concentrated on the game in front of them. It just can’t be done. That’s why it’s an alien and an android playing instead of humans. The actors can do it because all they’re really doing is waggling their fingers real fast, they don’t actually have to concentrate on their screen at all. Oh…well I guess it can be done. That’s a professional (yes, they get paid) gamer demonstrating his “Actions Per Minute” on the game Starcraft. Which is also interesting because Starcraft is a Strategy game and Strategema was supposed to be the ultimate test of strategic knowledge. Coincidence? I have no idea. Anyone else find it creepy that something this specific was foreseen by Star Trek? 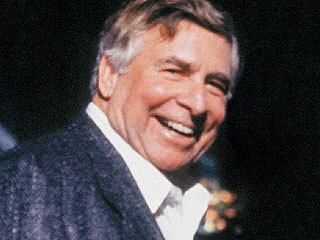 Gene Roddenberry: Scifi writer or Future-seeing Wizard? This is actually much more advanced than the one I went into took up the entire room. 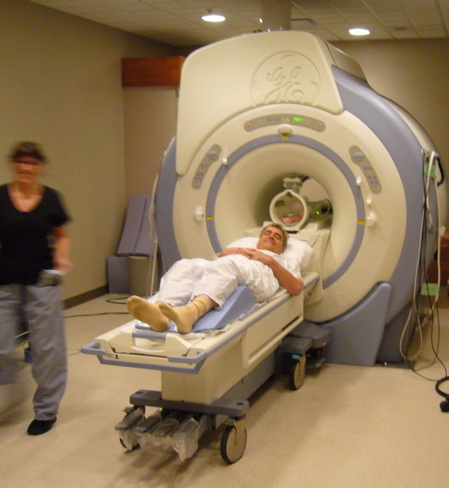 A hospital bed with a medical scanner/MRI built right into the bed! But that’s not all? Ever fancy a hypospray, you know, skipping the whole needle thing? Well we have those too! No really, we use them on cats. Even looks a bit like the Star Trek version. I used to work as a Vet assistant (a fancy title meaning I used to clean up the poop and pee left behind by patients) and my eyes nearly popped out of their sockets when I first saw these babies in use. 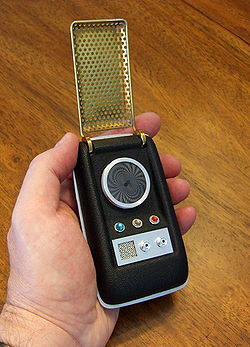 I learned how to use one specifically because it made me feel like I was in Star Trek. It’s not just the cool gadgets either. Just in the past year (2012) alone we’ve made huge leaps in finding cures for: Alzheimer’s, Cancer, Aneurysms, HIV/AIDS, and countless others. Seriously, every year we make leaps in our medical understanding. We have treatments and technologies available today that would have seemed like Scifi just ten years ago. If that doesn’t tell you we’re living in the future I don’t know what will. Maybe it’s just me, but “1. Futuristic Medicine” block seems to be messed up. Letters are on picture. Thanks for the heads-up on that! It should be fixed now. Ive played 2 of the 5 episodes available by now, and they were awesome! I think it also seized some prices in the gaming world, for being the best adventure released in 2012. Well, ive played many point and clicks this year, and i have to say, up and until now, walking dead seems to have earned its price for being the best! Yeah, Walking Dead video game has been on my to do list for a while. I think I’ll bump it up to the top and see why its so awesome! I have really enjoyed browsing your blog posts. In any case I’ll be subscribing to your rss feed and I hope you write again soon!